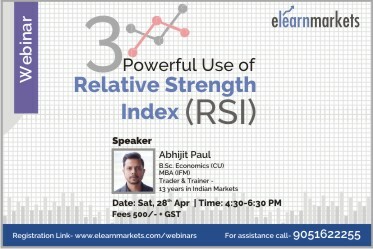 Relative Strength Index (RSI) is one of the most popular and probably the most popularly misunderstood technical indicators. There is not a single book in the field of technical analysis that will not mention this versatile indicator. However, if you learn the bookish RSI, you'll find it tough to book profits consistently. In this webinar, we take a deeper dive into RSI and discuss 3 very important & unique use of the indicator. Get to know the simple yet versatile nature of the RSI indicator. How to use RSI as a Trend indicator. How to utilize RSI to spot Classical and Hidden Divergences. How to use the indicator to project zones of comfort. Abhijit likes to define himself with the 3is – investor, instructor, and influencer. With over 13 years of experience in the Indian Financial markets, he has played pivotal roles in institutions like ICICI Securities and BRICS Securities, Mumbai. Currently, he is a SEBI Registered Research Analyst (Registration# INH 300003512) and offers unparalleled services to his client. He believes in context to be more important than content which reflects in his offerings like alphaBETS, WealthBees. He has been an active trainer in the subject of technical analysis and trading for over 12 years and visits various business schools and institutions like NSE Academy, NIBM Pune, BIBS Kolkata, India Infoline, Kredent Academy & elearnmarkets. He personally conducts offline and online programs like 10XBootCamp and Qualified Market Trader (QMT), which are both unique path-breaking workshops in designing and implementing different types of trading strategies. Excellent Webinar, Presenter has covered and explained the concepts in easy to understand manner. Should try and provide a summary sheet / recording of webinar. Please discourage attendees to ask their chart analysis during the webinar. Take more time on explaining the concepts rather than honoring the request of people to look into charts they suggest. Usually, people ask about analysis on stocks which they have in their portfolio. More time on the concept is always more beneficial. Thank You. The secession was wonderful. Try to cover the basic candlestick pattern and more useful trading tools. Webinar was excellent. Would like to hear more from Abihijit in future. Very good and informative session. Excellent techniques which can be implemented. Please keep me posted on more sessions from Abhijit Paul! Sir, Thanks a lot for sharing and explaining the concepts in a beautiful way. If the notes of the session shared with the attendees, that would be great. Trainer was Fantastic. Well explained and Powerful strategy.